I have a special treat toward the end of this blog, if I can get it to work! 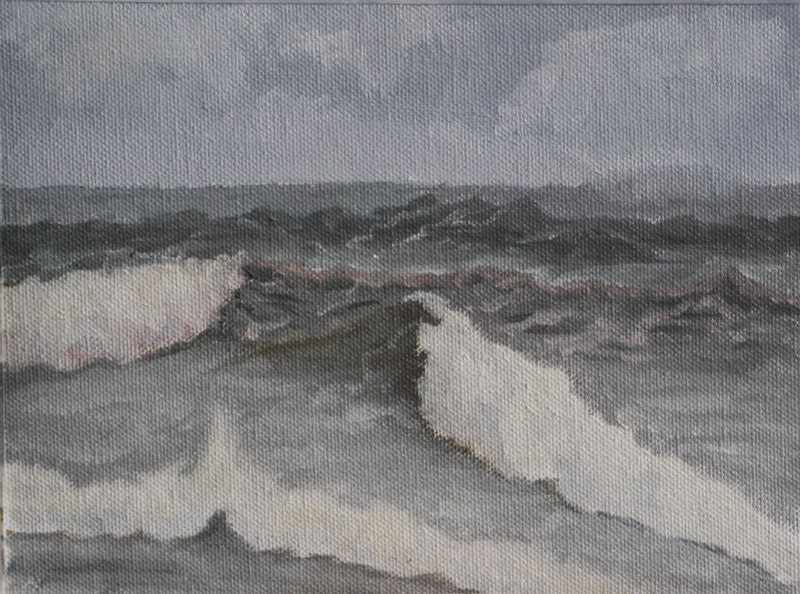 But first, here is Wave Study #34 which I painted this morning. I am now officially a third of the way through my 100 wave study goal! As you can see, still working on those cross waves. They were out in force and spectacular this morning. I was practically dancing around with frustration at not quite having the skills to capture all of the variations fast enough. A camera is not the solution either, trust me on this. There are so many subtle nuances that the camera does not capture and I want to paint powerful and truthful waves. The weather was a bit rough and squally. One minute sunshine on my easel, the next, hanging on to my umbrella with rain lashing across the canvas and palette. It wasn't too cold though and, whoosh, it was beautiful! I have a strong suspicion that I will need to do another 100 wave studies or more after this set just to get everything down. I will have to compare next January with this one to see the difference. So, here is my treat, I managed to get a little video of the morning waves with my phone cam. You can hear the sound of the waves and spot a few of those cross waves. Unfortunately I couldn't zoom in to get the actual size of the view. I got another video of a sneaker wave running up the beach but it is a bit more shaky than this. This is handheld but not too bad. Hmm, that seemed easy. Let us hope it works! So good to get out to paint again!